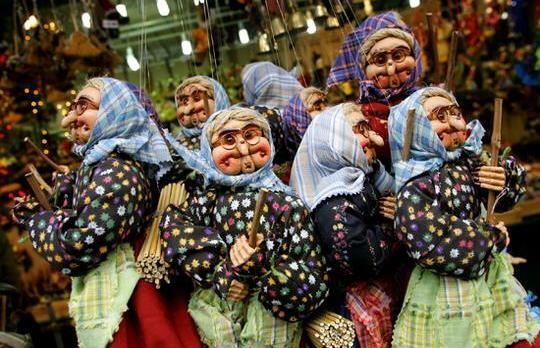 Wooden puppets depicting Italy’s gift giver, Befana. 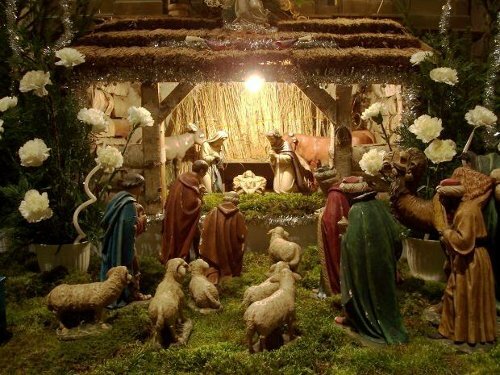 The most cherished custom of the Italian Christmas is setting up and displaying the crèche or nativity scene. As the focus of the family’s decorating, the crèche may be simple and homemade or very elaborate with hundreds of pieces and many scenes. The tradition of the nativity scene was started in the early 1200s by St. Francis of Assisi who told the story of the birth of Christ using a living nativity complete with live animals. Contests are held every year for the best nativity display. Some towns get into the spirit by hosting living nativities some with up to 600 actors involved. No matter how simple or how fancy the crèche, the Christ child in the manger is most cherished by the Italian people. Many will place their presents near the manger instead of under a Christmas tree, and families may even pray together in front of the manger. A favorite set of figures found in many nativity scenes are the shepherds playing bagpipes. Legend has it that shepherds playing bagpipes played for Mary in Bethlehem when Christ was born. At one time bagpipe-playing shepherds would come from the fields in the mountains to play at Christmastime in the marketplaces and other locations in Rome. Today folk musicians, called zampognari, keep the tradition alive. These zampognari visit every carpenter’s shop and ever nativity and sing and play in front of the manger scene especially during the Christmas Novena. It is no wonder that the sound that most characterizes the Italian Christmas is that of bagpipe-playing zampognari. Christmas trees are not as popular in Italy as they are in other areas of the world. Trees are most popular in the northern regions of Italy. Christmas trees may be imported from northern Europe, be artificial, or be live, potted trees. Many good things to eat are hung from the branches accompanied by many lights and other baubles. In Southern Italy many people hang fresh fruit and foil-covered chocolates on their tree. Children are allowed to eat the trimmings on January 6. On Christmas Eve day a strict fast is observed until evening when a meatless meal is served. Fish may be served at this meal but no meat. Christmas day is a feast day. There is no “typical” Christmas menu. The main dish usually varies according to the region and the tastes and traditions of the family. In southern Italy baked, roasted, fried, or steamed eels served with rice may be the main dish while squid is a favorite along the sea coast. Other dishes enjoyed during the Christmas feast include clams, codfish, many kinds of beans, vegetables in vinegar, salads, bread, and pasta. Gift giving in Italy is not associated with Christmas, as it is in many parts of the world. Instead Italians give gifts to each other on the day legend says the three kings gave their gifts to the Christ child, Epiphany or January 6. The story goes that as the three kings were on their way to Bethlehem they stopped at the house of an old woman to ask for directions. The old woman was busy cleaning her house and was angry at the kings for interrupting her work. The kings explained they were on their way to find a baby, the Christ child, born King of the Jews and worship him. Would she like to go along with them? No, she did not know how to get to Bethlehem nor did she want to find a squalling baby and worship him. “Now go away and let me get back to my work.” The kings left. The next morning the old woman had second thoughts. She started following the three kings hoping to find them. She could not find them. She stopped to ask about the kings and to ask for directions for Bethlehem. No one could help her. She traveled on looking for the baby and his parents. As she traveled she started leaving presents for the children in houses she passed. She wanted to give presents to the Christ child, but she did not know where he might be living. Legend says she is still wandering through the Earth looking for the Christ child. This old woman known as Befana gives gifts to Italian children on January 6. The name Befana comes from the Italian word for Epiphany, Epifania. She is personified with white, disheveled hair, a hooked nose, and dressed in black. She is often portrayed as riding a broomstick. The first mention of Befana in Italian literature was in a poem written by Agnolo Firenzada, a poet from Tuscany. Children write notes to Befana asking for toys during the weeks preceding Epiphany. Today, while Befana is the gift bearer for Italian children, Santa Claus is making inroads in Italian society. As the Italian people say goodbye to the old year Befana appears again. In many towns and cities across Italy people go to the town square and burn a Befana puppet or a straw effigy of Befana. This time Befana symbolizes the ending of the old year and the beginning of the new year. The Italian people have many wonderful customs for celebrating Christmas. From the intricate nativity villages to the bagpipe-playing zampognari to gift-giving Befana: these traditions bring Italian uniqueness to the world’s customs of Christmas. If you wish to have an Italian Christmas this year you may want to have this favorite Italian Christmas dish. Cut eels crosswise into 3-inch pieces. Coat with flour and season with salt, pepper, and rosemary. Heat oil in a skillet. Add coated eel pieces and fry over medium heat until golden brown on both sides (about 10 minutes). Accompany eel with lemon slices. Makes about 6 servings. Italy enjoys a wide range of weather conditions during the Christmas season. In southern Italy Christmas is warm and sunny. In Rome, Christmas tends to be chilly and damp, almost Spring-like. In the mountain regions of northern Italy, Christmases are white with a lot of snow, ice, and cold temperatures. Preparations for Christmas begin in December. People around Sicily also enjoy puppet shows with hand-carved puppets performing fairy tale stories and enacting legendary battle scenes. Storekeepers decorate their shops with lights and greenery. Families visit vibrant Christmas markets looking for presents, goodies, and new figures to add to the home manger scene. In the schools children put on plays, give recitals, and make decorations. People begin visiting friends and family bringing gifts, sharing good food, and visiting as many magnificent nativity displays as possible. On December 6 many Italians celebrate the feast day of San Nicola (St. Nicholas). All along the Adriatic coast, children anxiously await the visit of the saint with his gifts and goodies he brings. On December 13 the people of Sicily celebrate the feast day of Santa Lucia (St. Lucy). Tradition says that, on the eve of her day, Lucia travels the countryside accompanied by a donkey carrying baskets loaded with gifts for those she visits. Children leave their shoes on the doorstep along with food for the donkey. Lucia then fills the shoes with presents. On the morning of St. Lucia’s day, a child, usually the oldest daughter of the family, dresses up as Lucia and serves the family breakfast in bed. The Christmas season really starts in Italy with Christmas Novena. This is a nine-day period of spiritual preparation ending Christmas Eve marked by attending church services. Christmas Eve is spent with family and for making final preparations for Christmas day. They may enjoy the sights and sounds of Christmas and the smells of the Christmas markets. Some Italians attend midnight Christmas Eve services at their local churches. In Cortina D’Apezzo, a town in northern Italy, families gather to watch the Alpine guides ski down the mountain carrying flaming torches. Christmas Day arrives with the pealing of hundreds of church bells. The tradition of ringing church bells at Christmas is thought to have begun nearly 1,600 years ago by Bishop Paulinas of Nola. Families spend the day together exchanging gifts, playing games, telling stories, and feasting. On December 26 a number of Italians celebrate St. Stephen’s Day. Once a day of religious devotion St Stephen’s Day is now spent relaxing or visiting friends and family. As Christianity spread in Italy in times past the Christmas season was extended to January 6, the Feast of the Epiphany. Cities and towns host Epiphany parades, and people sing songs honoring the three kings. The following recipe is a favorite at Christmastime in Italy. Combine almond paste, sugar, and egg whites in a bowl and work with a spoon until smooth. Drop by teaspoonfuls onto cookie sheets lined with unglazed paper. Top with pine nuts. Bake at 325 degrees Fahrenheit about 12 minutes, or until delicately browned. Cool slightly, then remove cookies to racks to cool. Makes about 3 dozen cookies.